The clock is 9 1/4 overall with a 5 1/4 dial. 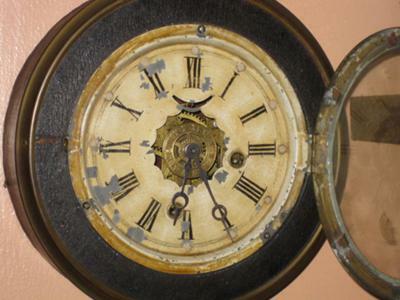 It appears covered on the sides and ring around the dial in leather or some type of leather like paper ( very brittle ). I looked at the internals and found nothing. There is an F between 11/12 and an S between 12/1.